I am Regan and my hubby is The Priest from the movie The Exorcist. I bought a gown and had a wig fm previous year. I bought green zombie makeup. I put green zombie make on my clothes and mouth for vomit like the movie. I used blk gel eyeliner on teeth. I used zombie blood for cuts and orangish with blk eyeshadow for eyes. 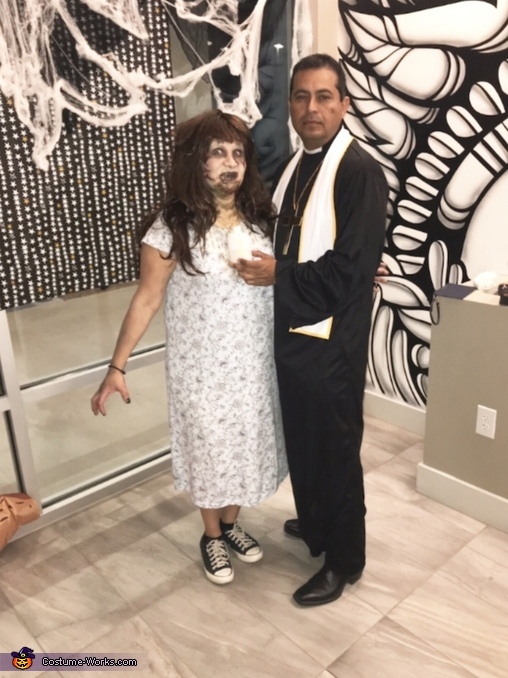 I bought my hubbys costume The Priest second hand and had a holy bottle and just put water.